Hayes and co-workers are back with another rich contribution, based on dissolved 232-thorium (232Th) and 230-thorium (230Th) (click here to access previous highlight from the same author). both tracers can be used to estimate dust fluxes over a given oceanic area. They show that this flux is twice the modelled one in the subarctic part of the section whereas it is more consistent in the subtropics. both tracers are very good proxies for the estimate of boundary exchange processes in deep water along the North Pacific margins which seems to be quite significant in this area. Figure: Eolian dust fluxes to the North Pacific as estimated from dissolved 232Th-230Th measurements (represented by circles) and from model estimates constrained largely from satellite optical depth (represented by the colormap from Mahowald et al. 2005). The same colour codes have been used for the circles and the colormap. Click here to see the figure larger. Hayes, C. T., Anderson, R. F., Fleisher, M. Q., Serno, S., Winckler, G., & Gersonde, R. (2013). 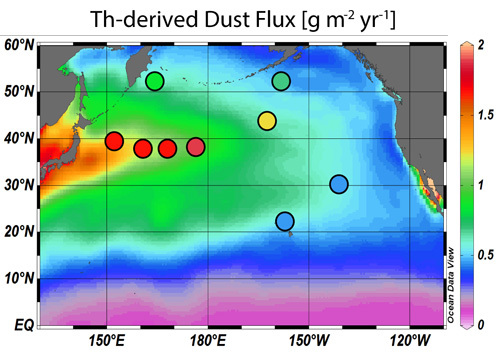 Quantifying lithogenic inputs to the North Pacific Ocean using the long-lived thorium isotopes. Earth and Planetary Science Letters, 383, 16–25. DOI: 10.1016/j.epsl.2013.09.025. Click here to access the paper. Mahowald, N. M., A. R. Baker, G. Bergametti, N. Brooks, R. A. Duce, T. D. Jickells, N. Kubilay, J. M. Prospero, and I. Tegen (2005), Atmospheric global dust cycle and iron inputs to the ocean, Global Biogeochem. Cycles, 19, GB4025, DOI:10.1029/2004GB002402. Click here to access the paper.